William Richman Piddington was born in 1815 in London. He was unmarried. He died on 25 November 1887, aged 73 at Sydney, and was buried in the Anglican section of Rookwood Cemetery. William Piddington worked in Edgeley’s Bookshop in London before emigrating to New South Wales in 1838 and farming on the Hunter River. He returned to Sydney in February 1848 to join WA Colman, bookseller of George Street, and soon set up his own business as a bookseller and stationer at 332 George Street. In 1853 he published Charles Harper’s The Bushranger. In 1876 at Mount Victoria, he built The Grange, a long low bungalow designed by John Horbury Hunt and also known as Piddington’s Grange. Piddington represented the seat of Northumberland and Hunter in the NSW Legislative Assembly from 1856 to 1858. He supported the development of a rural railway system and the extension of local government. 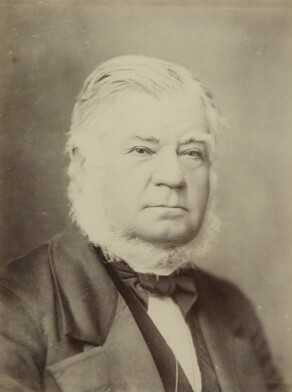 From 1859 to 1877, he was the member for Hawkesbury. He was the NSW Colonial Treasurer in 1872 and again in 1877. Piddington was appointed to the Legislative Council in 1879 on Henry Parkes recommendation and was Chairman of Committees between 1885 and 1887. Piddington was elected Alderman of the Sydney City Council on 1 November 1851 but resigned on 9 August 1852 because he found the Council unworkable. D. I. McDonald, ‘Piddington, William Richman (1815–1887)’, Australian Dictionary of Biography, National Centre of Biography, Australian National University, http://adb.anu.edu.au/biography/piddington-william-richman-4398/text7169, accessed 7 December 2012.